The agenda for the April 6, 2018 Mendocino Coast District Hospital (MCDH) was scheduled as “Closed Session” to consider proposed appointment and contract for permanent Chief Financial Officer (CFO) and “Public Comment”. Proceeds go to the Northern California Sea Urchin eradication effort through the Waterman’s Alliance Group. 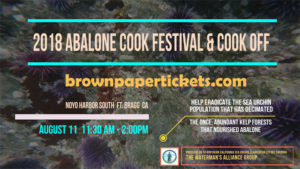 Help eradicate the purple sea urchin population that has decimated the once-abundant kelp forests that nourished abalone. Malcolm Macdonald, reporter for the Anderson Valley Advocate, made effective use of the opportunity to speak as he challenged Dr. Lucas Campos’s MCDH board representation and later addressed his claim that the MCDH Board did not appropriately discharge the previous Interim CFO, John Parigi, and the fact that the MCDH Board appeared to dismiss its new legal Merrill Arnone & Jones, after paying $40,000 for 2 months, without public notice. He brought to the Board’s attention that in addition to missing 3 consecutive meetings, Dr. Lucas Campos can be removed by MCDH Board resolution if he missed 3 out of the 5 last meetings or if his legal residence is still in the MCHD district. Dr. Campos, attending by phone from Chico, does claim Fort Bragg as his permanent address. President Lund agreed that there is a need for the MCDH Board to review the official statutes and minutes, as the missing 3 out of 5 meetings may apply to Dr. Campos. While Dr. Campos still claims to live here, he also says he has to travel for work, which makes one wonder just how involved and informed he is about the community he has legally pledged to represent. Additionally, Board Member Peter Glusker, MD, also again raised the issues regarding Dr. Campos’s legal membership on the MCDH Board, requesting this be researched and brought to the April MCDH Board Meeting if direct action needs to be taken. Mr. Lund agreed both to talk to Dr. Campos and research it, calling for further action if legally warranted. Mr. Macdonald’s second concerns really relate back to this ongoing MCDH issue of lack of transparency and trust with decisions being made either inappropriately, not properly applying their legal processes or behind closed doors without informing the public. He thinks that CEO Bob Edwards made the decision not to renew Mr. Parigi’s contract without proper board action, since they only ratified it on his last day of employment. He also pointed out that the legal firm of Merrill Arnone & Jones was dismissed and Attorney John Ruprecht was yanked from retirement without a word to the public, not even reporting on it after closed sessions, until Dr. Glusker brought it up at the end of the last meeting. The MCDH Board declined to remark on either matter, other than Dr. Miller insisting they used the proper process with Mr. Parigi, saying “Bob brought it to us”. Mr. Ruprecht claimed “he was just a temporary contractor, his contract was terminate able with 2 weeks’ notice and other issues I will not go into, that had to save this hospital. You can laugh but it is not funny. It was announced that Michael Ellis was hired as the new permanent Chief Financial Officer (CFO) and will begin his challenging position on April 10, 2018. Quick research indicates he worked as a CFO at Carson Valley Medical Center in Gardnerville, NV beginning in March 2017 and Hill Regional Hospital in Hillsboro, Texas in May 2015. Mendocino TV will keep you informed on his progress as he hopefully takes on the financial challenges and plans left by Mr. Parigi.